The first series last year was the latest attempt to fill the Saturday evening family slot made popular of late by Doctor Who. 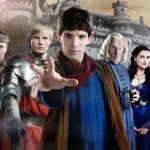 The story of a young Merlin and how he becomes the trusted aide of future king Arthur, it stars Colin Morgan (Merlin), Bradley James (Arthur), Anthony Head (King Uther Pendragon) and Richard Wilson as Gaius. It also features the renowned voice talents of John Hurt, who must have one of the best roles in showbiz, receiving top billing for voicing the Dragon in what was surely only an afternoon’s work for him. The second series has shown a marked improvement on season 1, with better stories and a cast that seem more at ease with their roles. The show has finally moved away from the repetitive structure of the first, where every week became a succession of ‘evil villain comes to Camelot’ type plots, and the mythology of the famous legend has woven in to it more and more. To help matters further, there’s been an array of guest stars each week too including Charles Dance, Sarah Parish, and Emilia Fox in the recurring role of Lady Morgause. This year also gave us a comedy two-parter where King Uther was enchanted by magic and fell in love with a troll, which worked surprisingly well and gave the cast a chance to really shine and show their talents. Merlin concludes this weekend, and promises to be a climatic finale as the dragon has finally been freed from imprisonment and it returns to Camelot to wreak havoc and revenge on Uther. Maybe they even had to get John Hurt in for another afternoon’s work? We shall see. Whatever happens, the BBC recently announced that the show has been recomissioned for a third series, so we can expect more magic next year. There were big changes this year in Primeval, as it started it’s run with new characters seemingly popping up everywhere, but perhaps the biggest change being that it suddenly became must see viewing. The plots seemed more assured, and in a similar vein to Merlin, it moved away from a simple ‘monster of the week’ set-up. So it was somewhat of a shame when ITV’s answer to Doctor Who was put up against that show’s Easter special Planet Of The Dead, where there was only ever going to be one winner. Primeval‘s viewing figures suffered badly, and viewers missed out on one of it’s most surprising twists with the exit of it’s lead character Professor Nick Cutter, played by Douglas Henshall. Surprisingly, his replacement in the show Danny Quinn, played by Jason Flemyng, slotted in to the cast even better, and Flemyng quite clearly seemed to relish the role he was given. Following Henshall out of the door was Lucy Brown who had played Jenny/Claudia (and with her any chance of season one’s cliffhanger ever being explained), and the cast was joined by Laila Rouass (who recently appeared in Strictly Come Dancing). Thankfully though, Ben Miller (of comedy duo Armstrong & Miller) still made frequent appearances as Sir James Lester, which were always entertaining. After such a strong run this time around, the third series oddly reached a bit of an anti-climax in the final episode, and it finished on an annoying cliffhanger for fans of the show, which seemed even more difficult to understand when it was reported that ITV had cancelled the show due to budget concerns. However good news was around the corner, as it was later announced that it had been given a reprieve as ITV signed a deal with digital channel Watch to co-produce a further set of 13 episodes, where transmission will be shared between the two. Added to that, Warner Brothers are developing a movie based on the show for future release, so it’s future looks good for now. A series that started off weakly, but always showed promise, Dollhouse has slowly grown in to a great show that has moved so far away from it’s original brief, it’s sometimes hard to believe you’re watching the same programme. The creation of Joss Whedon, who also brought us Buffy, Angel and Firefly, it was always likely to be given more time to grow than some of it’s counterparts. Dollhouse stars Eliza Dushku (Buffy, Tru Calling) who plays Echo, a ‘doll’ in the Dollhouse, a secret organisation that has found a way to wipe people’s memories and imprint them with any personality they wish. The dolls are hired out to clients for various tasks, be it simple prostituion, escorting, or more adventurous roles such as hostage negotiations (being imprinted with the personality of the best negotiator). Of course, rumours about the Dollhouse grow, and this sets FBI agent Paul Ballard (played by Tahmoh Penikett from BSG) on it’s trail, and he slowly becomes obsessed with finding and saving Echo. Dushku is fine as Echo, but the show’s strength is in it’s supporting cast, especially Olivia Williams (Adele DeWitt), Fran Kranz (Topher Brink) and Enver Gjokaj as fellow ‘doll’ Victor. The second half of the first series improves immeasurably, and it becomes quite a multi-layered show, that asks many questions about what makes up personality, human rights, and the ethics of such a technique. There’s an excellent end to the series, where the big villain Alpha returns to the Dollhouse, and also a stunning standalone final episode Epitaph One that was strangely not shown in the US (but appears on the dvd set). Sadly, with American tv being so being so unforgiving, the show has recently been cancelled, but thankfully all thriteen episodes will be aired, and the story will reach it’s conclusion very soon with Epitaph Two. On the surface, Fringe might come across as some sort of X-Files rip-off, but in the hands of J.J. Abrams (Lost, Alias and Star Trek), it’s managed to rise above that and find it’s own feet, and style. Centering around what it calls ‘Fringe’ science, it brings to the screen weird and wonderful stories rooted in possible advances in science, that eventually lead towards our whole world being at risk. Starring Anna Torv as FBI agent Olivia Dunham, she is helped in her investigations by Peter Bishop (Joshua Jackson) and his father Walter (John Noble), a scientist who has been residing in a mental institution for years since his pioneering work in the fringe science arena. As the first series progresses, it becomes apparent that Walter‘s previous work is connected to events, and also that he keeps a very important secret regarding his son, Peter, and the threat to our world is originating from another ‘parallel’ world very similar to our own, but on it’s own technological path. The series finale finally takes us there, as Olivia is transported there by Walter‘s ex-partner William Bell, played by the legendary Leonard Nimoy. The final shot of the season is a very iconic, and shocking one, that certainly leaves you wanting more. The second season has been continuing apace to the same quality, with more tantalising hints of the other world, alongside a fair share of standalone episodes that the casual viewer can enjoy. The special effects in the show are often amazing, and it’s always coupled with great direction. And to compliment the seriousness of some plots, there’s always some great humour on show, more often than not delivered by Walter‘s strange behaviour as he tries to adapt to life back in the real world after years of being in a mental institution. It continues in the new year on Sky, who thankfully choose to air it a matter of days after it’s US transmission. After wowing tv audiences with it’s first season, the show has struggled ever since a lukewarm reaction to season 2 forced it’s creator Tim Kring to publicly apologise for it’s drop in quality. Season 3 didn’t start that well either, in my view, but by it’s second half was returning to it’s former glory. Thankfully, season 4 (due to be aired on the BBC in the new year) has taken that even further, and matches that first run in quality and feels closer to the comic book style that drew so many fans. I won’t say too much about the fourth season, so as not to spoil the UK transmissions, but I’ve really enjoyed it as much as the first so far. All the best characters are still there, along with a couple of new ones, and I feel they’re all utilised much better. Hiro, who has had some pretty weak storylines in seasons two and three, is much better served here, as is Peter Petrelli. There’s also a very welcome return for a much loved character from the first season, but you’ll have to wait and see who! The plotting seems to make much more sense, and there’s a nice theme of interconnection between all the various characters, something that was quite evident in the first season. And there’s also a mysterious travelling carnival, full of people with apparently strange abilities, that is often at the centre of events, who lend to the comic book style very well. So, if you’d become disillusioned with the show of late, I urge you to give it another try. This may well be it’s last outing, as the american networks have been getting jittery about it’s future. I for one hope it’s not, as the tv landscape will be a much poorer one without it. That’s all for now, I’ll return with my top five choices later in the week. Thanks for reading. This entry was posted on Friday, December 18th, 2009 at 5:31 pm	and is filed under Reviews, TV & Film. You can follow any responses to this entry through the RSS 2.0 feed. You can leave a response, or trackback from your own site. Thanks for your kind words, hope you enjoy the second part which has now been posted.